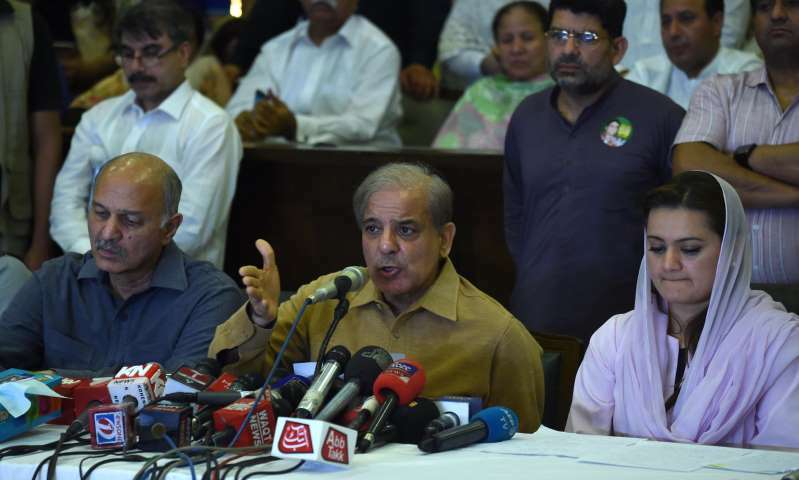 ‘Our democratic process has been pushed back by decades’, says Shahbaz Sharif (centre), the younger brother of the ousted Pakistani prime minister Nawaz Sharif. Pakistan’s general election has been plunged into chaos after the incumbent Pakistan Muslim League-Nawaz (PMLN) said it would reject the result amid widespread allegations that the military was rigging the ballot in favour of the party led by the former cricketer Imran Khan. With only a third of the vote counted by 3am – an hour after the result was officially due – Khan’s Pakistan-Tehreek-e-Insaf (PTI) led in 110 seats, with the PMLN trailing on 68. Most projections held that the PTI would go on to win between 107 and 120 seats out of a total 272 in the lower-house, exceeding expectations and delivering the role of prime minister to Khan for the first time. The Election Commission of Pakistan (ECP), an independent body, blamed the delay in announcing the result on a breakdown in the Results Transmission Software it purchased from a British company. But Shehbaz Sharif, the leader of the PMLN, said his party “wholly rejects” the result of the election, telling a press conference that his party’s polling agents had been evicted from dozens of stations by security officials before a final tally was reached, leaving them unable to monitor potential tampering. “The mandate of millions of people who came out to vote has been humiliated. Our democratic process has been pushed back by decades,” said Sharif. The PMLN, which tried to curb the power of the military while in office, has claimed for months that the establishment was “engineering” the vote against it. The party’s former leader Nawaz Sharif, who on 13 July began a legally-dubious 10-year prison sentence for corruption, has accused the deputy head of the country’s all-powerful ISI spy agency of leadinga campaign against the PMLN. He said it included pressure on its candidates to defect, a spate of court cases and the silencing of supportive media channels. As election workers sorted through massive piles of paper ballots, almost all the parties – except the PTI – alleged that their polling agents had been excluded from polling stations. Bilawal Bhutto, the leader of the liberal Pakistan People’s Party (PPP) – the country’s third-largest party – tweeted it was “inexcusable and outrageous” that his activists had been excluded “across the country”. The complaint was echoed by his rival Khadim Rizvi, the foul-mouthed cleric who leads the far-right Islamist group, Tehreek-e-Labbaik (TLP). “This is the worst rigging in history,” said a spokesman for Rizvi. The PMLN senator Musadik Malik told journalists that security officials had taken over proceedings inside polling stations, with a particular focus on constituencies where the race was close between the PTI and PMLN. Terming the vote a “contest between the forces of good and evil”, Naeem ul Haq, a spokesperson for Khan, said the party chairman would address the nation at 2pm on Thursday. Concerns about the electoral process were heightened after the ECP last month announced it would allow military officials inside polling stations, and granted them ultimate authority on proceedings there, while the armed forces announced it would deploy 371,000 troops on the day of the election, a fivefold increase on 2013 despite greatly improved security across the nation. After a bloody campaign in which a terrorist attack in the eastern province of Balochistan killed 151 people at a rally, fears of election day violence were confirmed. Within hours of the polls opening, a suicide attack in Balochistan’s capital, Quetta, added 31 to the death toll and was later claimed by Isis. The allegations of vote-rigging marred what was supposed to have been only the second transfer of power from one civilian government to another in Pakistan’s coup-prone 71-year existence. Many supporters argued that 65-year-old Khan, the captain who brought home the 1992 cricket World Cup and a notable philanthropist, could fulfil his promises to end corruption and turn Pakistan into an “Islamic welfare state”. At a street-party in Islamabad, PTI supporters danced ahead of the announcement of the official results. Earlier in the day, 20-year-old Muhammad Junaid brandished his ink-stained thumb outside a polling station in Islamabad and said: “We want change”. His friend, Muhammad Salman, 20, said that an entire generation of young voters were turning out for Khan after being unable to vote in 2013. Electoral projections suggested that the PTI would easily be able to form a coalition that would deliver the required 136-seat majority, drawing on the support of natural allies in the federally administered tribal areas and independent candidates. Analyst Fasi Zaka argued that long-term instability would be limited: “Shehbaz Sharif is not a rabble-rouser, he is an administrator,” he said, adding that the PPP would also quickly cool down if it received the projected 40 or so seats. Analysts said that, from an economic perspective, a stable PTI-led coalition would help the country deal with a looming current-account crisis.